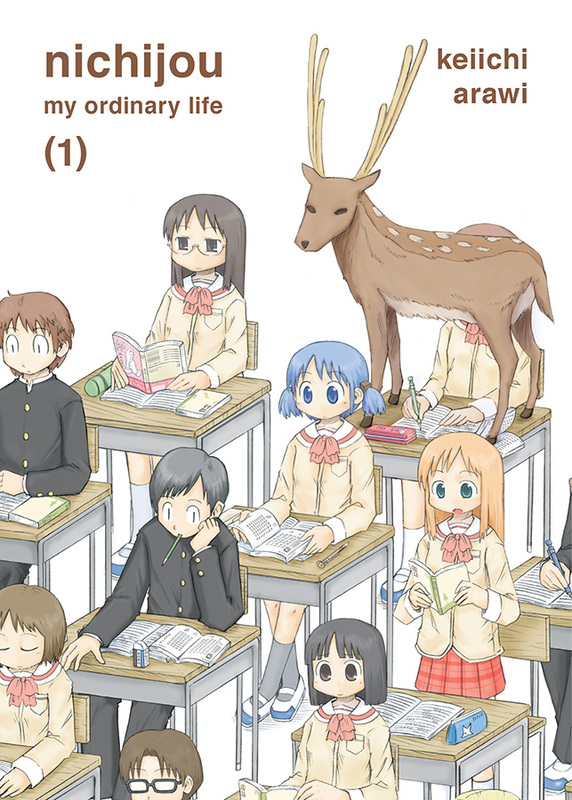 Nichijou follows the everyday lives of various people in the town of Tokisadame, mainly focusing on the energetic Yūko Aioi, the bright and cheerful Mio Naganohara, the quiet and deadpan Mai Minakami, the anxious robot Nano Shinonome, her eight-year-old creator the Professor, and a talking cat named Sakamoto, along with an ensemble cast of characters. Random and/or outlandish events regularly occur throughout the series, mainly through the mundane situations each character undergoes. 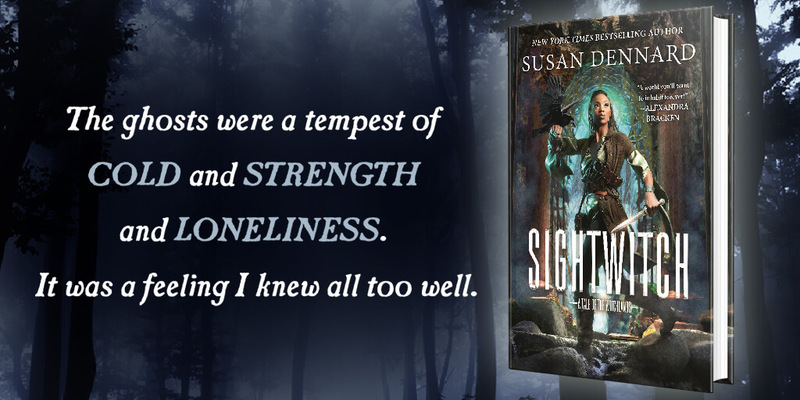 Wow, that’s a terrible blurb. 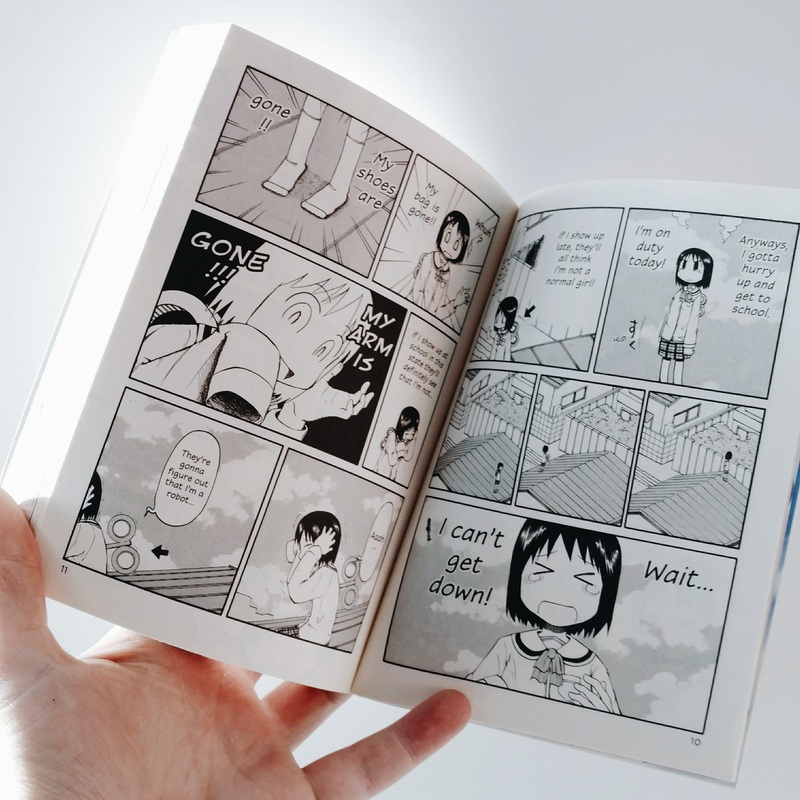 Nichijou means ‘everyday’ in Japanese, and the claim to fame for this 10 volume manga series is its extreme take on mundane events in the lives of several high schoolers. Varying from a robot hiding her cyborg parts from her classmates, and the dramatization of a papercut or crashing into someone, to the senseless violence of disagreements, and the secret history of unnoticed things. My favorites are probably the two friends, Mai, who is totally deadpan and Yuuko, who tries hard to make jokes. At one point Mio is trying to catch a sausage and it turns into something out of an action manga. I was so glad when she caught it again and was able to eat it — no matter whether the 5 second rule applies or not. I definitely sympathize with the robot girl, Nano, her professor is a little too blase about the random food hidden in her robot body! So many highlights, but without spoiling anything, I loved the Principal and the deer, the cat Sakamoto and the boy with the goat. This book was filled with gags, puns, jokes and haiku just riffing on a genre that usually isn't so outlandish. I like how the jokes build and the humor is gentle even while it is over the top. It’s an amazingly well struck balance. It’s an absurd take on slice-of-life and it’s really fun. I recommend giving it a chance if you want a laugh. With so much variety in a single volume, you're sure to find something you like.